Art Deco Meets Modernism? You Request It, Everest Designs and Builds It. We are proud of every gate that leaves our workshop. Each one is an original piece of functional art and will make your property stand out as the envy of your street. From Coldwater Canyon to Santa Monica, our custom iron gates can be seen everywhere, and each showcases Everest quality. Your custom iron gate shouldn’t just look incredible and turn heads, it should serve its purpose to keep unwanted people off your property. Our metal gates are stronger than any mass manufactured gate you get from the big home improvement stores, and we stand by its integrity. Give us a call today, and tell us what kind of gate you need to secure your home and while reflecting your style. Wrought Iron Gates – These gates add a classic look, and are perfect for a Victorian style home, Tuscan style, or if you want that gothic look. Wrought iron never goes out of style and does a great job withstanding the elements. With our wrought iron gates and iron driveway gates we can incorporate an authentic sand cast, and each panel, bat, and section is welded to perfection to guarantee unparalleled security and strength. To protect against rust we hot-dip each part in a galvanize bath to protect the iron gate against rust. Want to keep a sheen look? We can use a series of multistage pretreatments and use fade-resistant polyester powder coat finishes to keep your gate looking new year after year. These gates are stronger, but require a bit more care. Aluminum Gates – Our custom aluminum gates are popular with property owners because they tend to cost less that iron but still offer strength and structural integrity. We use beveled horizontal rails in most designs to add additional durability and our metalworkers can add original detailing and designs to your panels. We also rout the posts to keep bees and other stinging insects out, and this increases the structure’s strength. Like our iron gates, we can also use a fade-resistant polyester powder coat finish to keep your gate looking crisp all year long. These gates are still strong (though with enough force they can bend or bow under pressure), but not as resilient as iron. However, they require no maintenance except for routine tune-ups from your gate repair company. 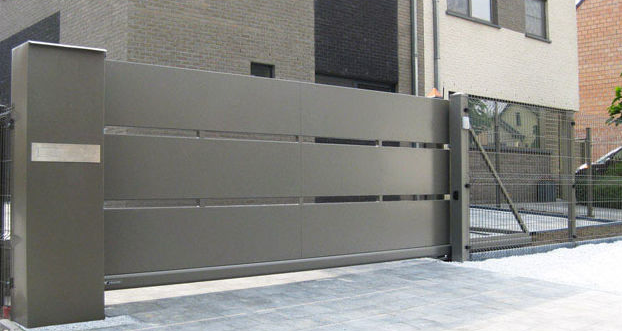 Steel Gates – Steel is stronger than both iron and aluminum. This means it is less likely to suffer from major damage in the event a car runs into it or a tree falls on the gate. This means if your driveway is at a high-risk environment, like at the end of a cul de sac or on a street with lots of traffic with little distance or material separating you, a steel gate would be a wise option. In terms of cons, steel fences are the most expensive, though Everest still offers the lowest prices on steel gates in Los Angeles. They are also harder to install, but installation is included so this should not be a concern. How can I Choose the Best Gate for my Driveway? Aesthetics – If you have a Victorian home then a steel panel driveway gate may clash with your home’s style. Consider what types of gates will compliment your home’s aesthetics. For example, a custom wrought iron gate would be ideal for a Victorian home, or a Tuscan style property. Do you have a modern home with sleek lines? Then a steel or aluminum modern door would be more appropriate if your intention is to compliment your home’s style. Durability – How durable does your gate need to be? If you live up in the hills off Mulholland Drive there may be minimal risk of something striking your gate. Therefore aluminum or wrought iron would be fine. If, on the other hand, you live in a high traffic area where a car could easily veer off the road and hit your gate, steel would be the better investment (and it will add resale value to your property). Swing Gate Vs Sliding Gate – If you have the room, then you can pick whichever style you like best. However, if your home is on a hill a swing gate won’t be possible; you will need a sliding gate. Also, if you have little room at the entrance to your driveway, a sliding gate would be the better choice because there won’t be room for the door to open or close. If you want a gate that operates in a simple format and that requires less care, a swing gate would be your best bet because sliding gates have a more intricate system. Why Get Your Custom Iron Gate from Everest?